Imperial Solutions Kitchen and Restaurant Cleaning Services provides a cost effective nightly cleaning service that keeps your Restaurant, Country Club, Bar, or Lounge at a high level of sanitation and appearance. When it comes to restaurant cleaning and commercial kitchen cleaning procedures, Imperial Solutions is committed to meeting and exceeding your expectations & goals. More restaurants and businesses trust us for our high quality and comprehensive cleaning of their restaurant’s kitchen, lobby, and restrooms. Nothing's more dangerous, or costly, than a greasy restaurant kitchen floor. Slips, trips or falls account for up to 15% or more of all workers compensation costs and one disabling injury can put you out of pocket $30,000 or more. Plus, it's easy to track grease into the main dining area putting your customers, and your wallet, in even more danger. Most restaurant cooks can make delicious food, but are not always as thorough in cleaning at the end of the night. Let us do the cleaning for you. After all, it's what we specialize in. Our kitchen cleaning method has been proven and perfected to keep your floors free from grease buildup and food particles. 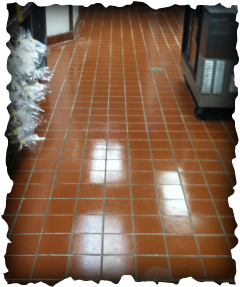 Click here to see more information on how we can restore and maintain your kitchen floors. 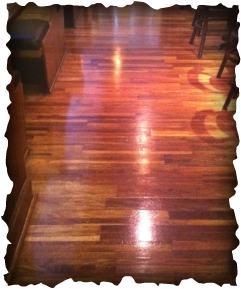 Restaurant cleanliness is a top priority for restaurant guests. On a recent poll, 88% of guests who encounter a dirty restroom assume the sanitation of the kitchen and food service areas are poor as well. All businesses need to have a sparkling clean restroom to avoid a negative impression. 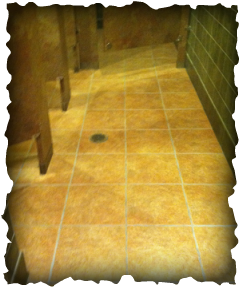 Imperial Solutions makes it a priority to clean and disinfect your restrooms. Click Here to see the difference we can make to your bathroom floor. Restaurants are the place where people sit, talk and spend some good time with their friends. People spend time where they feel at ease and find clean, germ free, and safe. There are so many details that can easily be overlooked by an untrained eye, as well as details that require special equipment or chemicals to be cleaned effectively. Imperial plays a vital role in cleaning your dining area. We take care of the dirt and dust to ensure that your guests have a fantastic dining experience. Remember, each restaurant can be different physically…..some have patios, some have bars, some are one floor, some have two floors, etc. Imperial's management works with the restaurant’s owner/manager and head chef to customize a cleaning program to accommodate each one’s special needs. washer removes build-up that mops and brushes cannot. 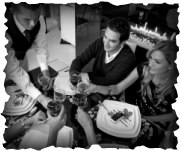 Restaurants, Bars, Lounges, Clubs, Commercial Food Establishments & More!